With air you can dump both axles for easier loading, but you can also plumb to just dump the rear axle so you can pivot on the front axle in a tight turn. You could also stretch out the axle spacing from the std 50/52” to what ever you want and that would put the front axle that much more forward, assisting with tight turns and rear air dumped. I guess the sliding option is probably either going to be hard to find, or too expensive or complicated. That leaves fixed air and fixed spring. Air you get the advantage of being able to lower it but the amount of use it will get probably isn't worth the money. For simplicity, you could always build an earth ramp at home and just drive onto the trailer deck and at the shows use someone else's tilting trailer. Sliding is a nice to have and if I found an economical way to do it, I think I might. I do need a change of suspension. So you aren't going to make it sliding? 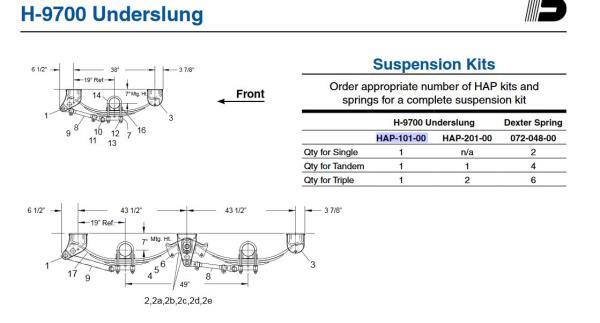 Looking like the most economical fixed option is Hutch/Hutchens 9700, underslung. I am finding some part numbers but having difficulty in figuring out which one is right. I need to find a local trailer parts place that knows their business when I get home. E-mail seems to be a act of futility so far. Likely pay big money at any yard. You need to find a trucking company with some old trailers or something along the road you can get for scrap price. When I stretched my truck, I got the whole frame/air ride/rear end assy for $500 with choice of gear ratio from local small truck repair place/junk yard. If I had gone to Adelmans, it would have been $1500. I need to find a nearby wrecking yard and start snooping around. That is one thing I haven't done is get familiar with the local wreckers. 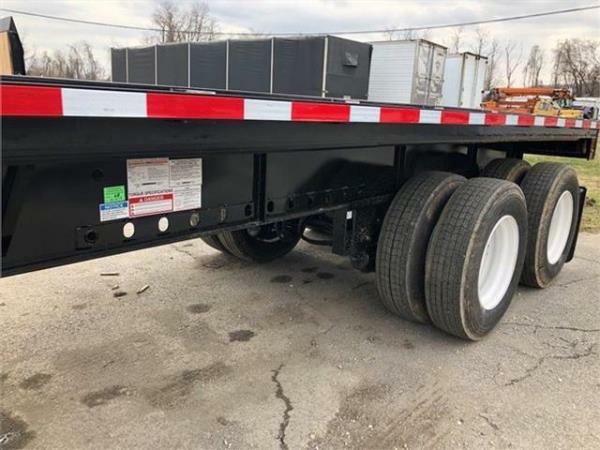 Seems like on the commercial sales side a take off trailer suspension is almost as expensive as buying all new parts. The axles being the big part. I don't need axles so I should be able to get what I need for less. Let the axles slide far enough and you won't need the fliptail. From looking online, flatbeds with I beam frame has the holes in the I beam. I suppose you could just drill just two sets of holes to give you a couple possibilities is doable? Then just back it with plating to keep the holes from wearing out. As long as the frame width matches the parts you buy out from under a trailer(that isn't too worn out already). Find a wrecked late model trailer(that isn't bent up), or buy new axle assembly?